As a hunter, I pride myself on eating mostly wild game. Both my husband and I love cooking, but more importantly we LOVE to eat. We both work full time though. As most know, sometimes the last thing you want to do after a long day of work is spend a lot of time in the kitchen. Unfortunately, this is why people often turn to unhealthy fast food. As someone that has started to really focus on health and fitness, I cant bring myself to sabotage my body with food that will leave me feeling terrible. This recipe is my personal savior on days that my husband and I are working late, or just know we are short on time. Ladies, I present to you one of the easiest, quickest, and delicious meals I make (outside of the slow cooker realm that is). Several people have told me that they can’t eat duck because it’s too gamely. I admit that I used to be one of those people. I think the key to liking duck is eating quality duck. Well what in the world does that mean? The taste of your waterfowl usually comes back to what they are feeding on. If you take a salt marsh black duck and throw it in a pan with some oil, it’s going to be terrible. The duck will inevitably taste and smell like the salt marsh. Ducks that are feeding on freshwater vegetation like wild rice, duck weed, and widgeon grass are my preference. Marinating is also a savior to masking some of those “gamey” flavors that not all people are fans of. For this recipe, you also want “clean” duck breasts, or ones that have not been shot up. When the ducks take pellets to the breasts, all of that coagulated blood adds to that gamey taste. To prepare your duck, you have a couple options. If you know you are going to be on a time crunch, do all of your meat prep work the night before. 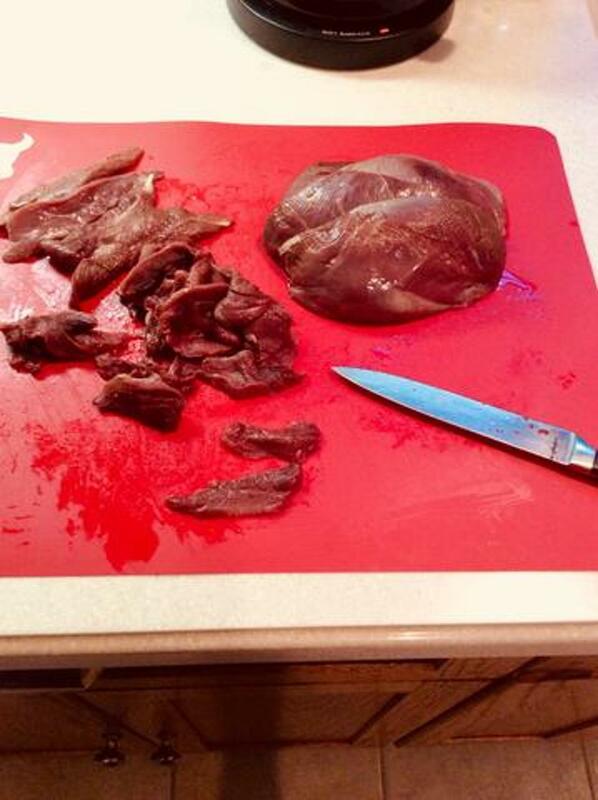 Slice your duck breasts extremely thin. When you use quality duck, you can store the duck “as is” in a zip lock until you are ready to cook it. If you use some breasts that were a little shot up OR if you just prefer more flavor (like myself), add a little bit of that stir-fry sauce to the zip lock. I want to make a note that ANY stir-fry sauce can be used in place of the general Tso’s. The stir fry sauces, oil, and noodles can all be found in the oriental section of your local grocery store. I, personally, have always used olive oil in place of the stir-fry oil. I am told that stir-fry oil and peanut oil are better because they can be cooked at higher temperatures though. The second best thing about this dish is that none of the ingredients are expensive. This recipe not only saves you time, but it is also friendly on your wallet. The noodles, sauce, and two bags of vegetables cost me a whopping $7.29. For the noodles, I bought “KA-ME” brand. Each packet comes with two pouches of noodles. When I cook for just my husband and I, I use one pouch of noodles. For four people, I cook both pouches. I always use two packages of vegetable because I simply love them. The noodles are amazing because they have the directions for cooking stir-fry right on the back. They are also lower in carbs than rice. Another note is that the Thai-Rice noodles have half the sodium of the Hokkien noodles (for those needing to watch their sodium intake). Depending on which noodles you get, the instructions are a little different, but here are the steps I use. 1. Heat 1 tbsp of oil in wok or LARGE skillet on high. Add sliced duck breast, and sauté for 1-2 minutes. Set aside. 2. 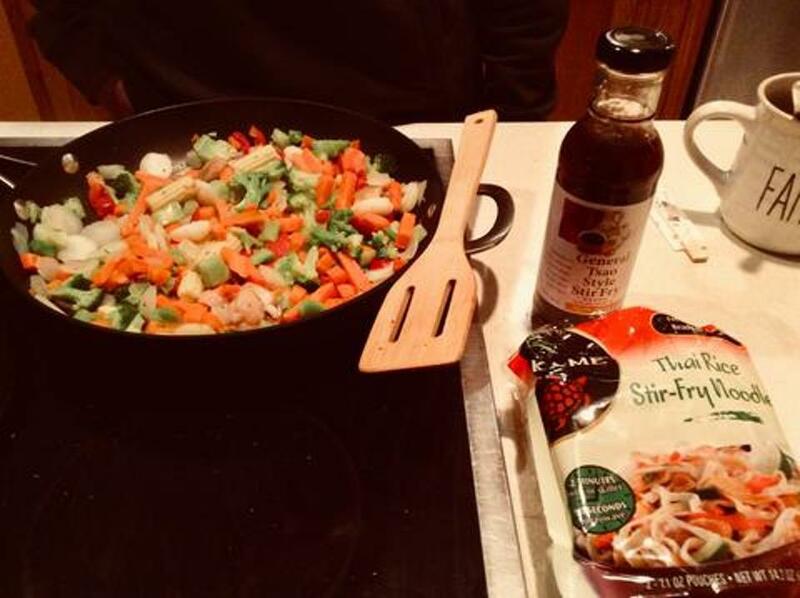 Add frozen stir-fry vegetables to wok with 1 tbsp of water. Cook for about 2 minutes. Make sure to stir the vegetables to insure that they are cook evenly. If there is a lot of residual moisture in the wok/pan, you can cook a little longer. 3. Add the duck back to the pan and as much stir fry sauce as you like. (I use about half a bottle of sauce and save the rest for the end.) Stir to make sure everything is coated. 4. Add 1-2 packages of noodles. Stir and cook for 2 minutes. Continue reading, Field to Plate: General Tso’s Duck Stir-Fry with Thai Rice Noodles, from Girls With Guns Clothing here.